The skeleton constitutes up to approximately 15% of total body weight and is among the largest organs/systems in the human body . Adult bone structure mainly includes cortical bone, cancellous bone (trabecular bone) and bone marrow cavity. Bone consists of three compartments: bone cells, extracellular organic matrix including collagen fibers and amorphous matrix, and extracellular minerals [2, 3]. There are three major types of bone cells in bone tissue: osteoblasts, osteoclasts, and osteocytes. Osteoblasts are the major cells responsible for bone formation, whereas osteoclasts mainly resorb bone. Bone homeostasis is maintained by the coupling between bone-forming and bone-resorbing (bone turnover). Osteocytes, which make up the majority of bone cells in the adult , are terminally differentiated osteolineage cells. Osteocytes are now recognized as important cells playing essential roles in skeletal development and especially homeostasis, including bone modeling and remodeling that was previously thought to be largely controlled by the osteoblasts and osteoclasts . The conventional function of the skeleton is as a static structural organ supporting body movement, protecting the internal organs, and as a reservoir of minerals . The skeleton is an important organ for the support of the body and for the attachment of muscles and tendons, as well as body movement. The skeleton protects the organs of the cranial and thoracic cavities from injuries, and it houses and protects the bone marrow within its cavities. Additionally, the skeleton has an important role as a reservoir of minerals such as calcium and phosphate, which can be released when demands are increased in the body, and in maintaining serum homeostasis . These conventional functions of skeleton depend on the homeostasis of bone itself. Recently, increasing studies have revealed that the skeleton contributes to whole body homeostasis and the maintenance of multiple important organs/systems such as hematopoiesis, immune activity, energy metabolism, and brain function. These functions affecting non-bone tissues are called extraskeletal functions [6, 7]. Bone tissue and cells can generate a variety of substances such as proteins/peptides including growth factors, chemokines, cytokines etc., as well as matrix degradation products, metallic/non-metallic elements, metabolic products, and extracellular vesicles (such as exosomes and micro vesicles) [8, 9], which can be collectively defined as bone-derived factors (BDFs) (Figure 1). In addition to their roles in regulating bone modeling and remodeling, these BDFs are the major factors mediating the extraskeletal functions of bone [1, 7, 8]. Bone-derived factors (BDFs) from bone. Bone tissue and cells can generate a variety of substances. (A) Proteins/peptides including growth factors, chemokines, cytokines, matrix protein and enzymes etc. such as FGF23, CXCL12, ILs, OC and others. 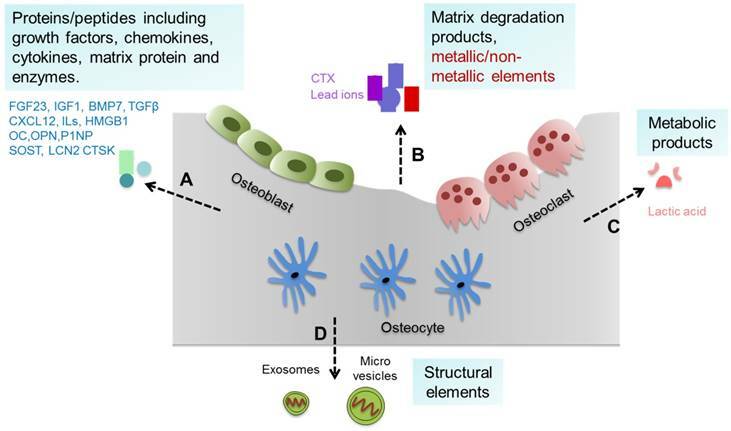 (B) Matrix degradation products and metallic/non-metallic elements released during bone resorption such as CTX and lead ions. (C) Metabolic products of bone cells such as lactic acid. (D) Structural elements secreted by bone cells such as exosomes and micro vesicles. Hosted by bone tissue, hematopoietic stem cells (HSCs) in bone marrow are able to differentiate into all hematopoietic lineages. The functional communication among different bone cell types and hematopoiesis in the bone marrow has been extensively studied in recent decades. Mesenchymal stem cells, osteoblasts, and other cells in the bone marrow form a special local environment termed a “niche,” which not only nests the HSCs but also helps to maintain the stemness of the resident HSCs [10-12] (Figure 2A). Osteoblasts are indispensable for the quiescent status and self-renewal of HSCs. The absence of osteoblasts leads to decreased self-renewal of HSCs in the bone marrow . Activation of parathyroid hormone (PTH) signaling in osteoblasts results in increased numbers of both osteoblasts and HSCs . Spindle-shaped N-cadherin positive (N-cadherin+) osteoblasts (known to enrich osteoprogenitors) are mainly located on the surface of cancellous/trabecular bone and are directly attached to long-term HSCs (LT-HSCs) and maintain HSC quiescence [14, 15]. In addition to directly attaching to HSCs, some molecules secreted from osteoblasts can support HSCs. For example, Wnt11, one of the osteoblast derived Wnt ligands, activates non-canonical Wnt signaling mediated by Fmi and Fz8 in HSCs and maintains the quiescent status of HSCs in the bone marrow niche . Thrombopoietin and angiopoietin-1 secreted by osteoblasts can also regulate HSC quiescence [17, 18]. In addition, osteoblasts play an important role in lymphopoiesis, myelopoiesis and megakaryopoiesis. C-X-C motif chemokine ligand 12 (CXCL12) is a chemokine that regulates HSC maintenance and retention [19, 20] and is required for lymphopoiesis and myelopoiesis [21, 22]. The deletion of CXCL12 from osteoblasts led to depletion of certain early lymphoid progenitors but not HSCs, suggesting that osteoblast CXCL12 mainly promotes the maintenance of early lymphoid progenitors . The deletion of interleukin 7 (IL-7) in osteoblasts led to a lymphopenic phenotype by decreasing common lymphoid progenitor number but not HSCs, indicating the important effect of osteoblast IL-7 on lymphopoiesis . Furthermore, m-TORC1 signaling inhibits megakaryopoiesis through decreasing the osteoblast derived IL-9 levels . Schematic diagram illustrating the effects of some molecules generated by bone on systemic homeostasis. (A) Some molecules secreted by osteoblasts, osteocytes and osteoclasts such as CXCL12, CTSK, G-CSF, MMP-9, IL-7 and IL-9 play very important roles in regulating HSCs maintenance, expansion or mobilization, and thus influence the hematopoietic and immune systems such as lymphopoiesis and megakaryopoiesis. (B) FGF23 inhibits phosphate reabsorption and promotes calcium and sodium reabsorption in the kidney. (C) GluOC and LCN2 induce insulin production and improve insulin sensitivity and then regulate energy expenditure. Sclerostin secreted by osteocytes regulates insulin sensitivity and metabolism of adipocytes. (D) GluOC promotes brain development and cognitive function. (E) GluOC can regulate male fertility by promoting testosterone production and inhibiting the apoptosis of Leydig cells in testes. (F) Bone regulates muscle mass and exercise capacity through secretion of GluOC, PGE2, VEGF, and others. Osteoclasts are another important cells regulating hematopoiesis in bone. Engraftment of HSCs to bone marrow depends on local level of calcium ion elevated during bone resorption . Cathepsin K, the major bone-resorbing proteinase secreted by osteoclasts, cleaves CXCL12 and stem cell factor (SCF) in the stem cell niche, which is associated with promoted mobilization of hematopoietic progenitor cells (HPCs) into the systemic circulation . Matrix metalloproteinase 9 (MMP-9) secreted by osteoclasts induces the release of SCF from bone marrow stromal cells to promote hematopoietic reconstitution, suggesting an important role of osteoclasts in HSC niche maintenance and mobilization . Administration of receptor activator of nuclear factor-κ B ligand (RANKL) increases concomitant mobilization of HSCs to the systemic circulation by promoting bone resorption , while inhibition of osteoclast function by bisphosphonates treatment (clinical drugs used to treat osteoporosis) reduced HSC numbers in mice . The absence of osteoclast activity results in a defective HSC niche associated with an increased proportion of mesenchymal progenitors but reduced osteoblastic differentiation, leading to impaired HSC homing to the bone marrow . It is suggested that bone marrow B lymphopoiesis is also regulated by osteoclast activity. Inhibiting osteoclast activity by zoledronic acid injections caused a decrease in the number of B-cells in the bone marrow in mice, resulting from decreased expression of CXCL12 and IL-7 by stromal cells, associated with reduced osteoblastic engagement . Several studies have revealed that osteocytes also regulate the endosteal microenvironment and hematopoiesis. The ablation of osteocytes led to severe lymphopenia due to the lack of lymphoid-supporting stroma in both the bone marrow for B-cell precursors and the thymus for T-cell precursors, and a marked loss of white adipose tissues . Osteocytes produce granulocyte-colony stimulating factor (G-CSF), an important factor promoting myeloid expansion in the bone marrow. The deletion of Gs alpha specifically in osteocytes resulted in enhanced G-CSF production . In the last 10 years, bone has been recognized as an important endocrine organ regulating multiple metabolic processes. Mineral metabolism is very important for homeostasis. In addition to storing minerals, the skeleton also regulates systemic mineral metabolism through an endocrine manner (Figure 2B). Fibroblast growth factor 23 (FGF23), a member of the FGF family, is a bone-derived hormone secreted by osteoblasts and osteocytes. Mutations in FGF23 prevent its cleavage, resulting in autosomal-dominant hypophosphatemic rickets (ADHR), which is characterized by low serum phosphorus concentrations, rickets, osteomalacia, etc. [32-35]. The overproduction of FGF23 by tumors  and osteogenic cells in fibrous dysplastic lesions  is responsible for the hypophosphatemia in tumor-induced osteomalacia (TIO) and fibrous dysplasia. These studies help to define the critical role of FGF23 in regulating phosphate metabolism. FGF23 inhibits phosphate reabsorption by inhibiting expression of the type IIa sodium-phosphate co-transporter (NaPi-2a) in the proximal tubules of the kidney through binding to a FGFR1-α-Klotho co-receptor complex [38-40], leading to phosphate loss. FGF23 also regulates calcium and sodium reabsorption of the kidney [41, 42]. FGF23 promotes renal calcium reabsorption through the transient receptor potential vanilloid-5 (TRPV5) channel in the distal renal tubules , and FGF23 promotes sodium reabsorption through the sodium-chloride co-transporter (NCC) in the renal distal renal tubules and leads to volume expansion and hypertension . In addition, FGF23 systematically regulates serum calcium and phosphate by regulating levels of PTH and the active form of vitamin D (1,25-dihydroxyvitamin D3, 1,25(OH)2D3). PTH promotes calcium release from bone by stimulating bone resorption and calcium absorption in the kidney and intestinal calcium absorption via an increase in the 1,25(OH)2D3 level. PTH also inhibits phosphate reabsorption in the kidney . 1,25(OH)2D3 promotes calcium absorption in the small intestine and phosphate reabsorption by suppressing the PTH level in the kidney . FGF23 inhibits PTH synthesis and secretion in the parathyroid in a Klotho-dependent or independent manner [45, 46] and suppresses the synthesis of 1,25(OH)2D3 by inhibiting 25-hydroxyvitamin D-1a-hydroxylase (1a-OHase) and increasing 25-hydroxyvitamin D-24-hydroxylase (24-OHase) in the kidney . These studies demonstrate that FGF23 regulates mineral metabolism locally in the kidney and systematically by regulating PTH and 1,25(OH)2D3. As an endocrine organ, bone also regulates glucose and energy metabolism through different pathways (Figure 2C). Osteocalcin (OC) is another osteoblast-secreted multifunctional hormone and is embedded in the bone matrix during bone formation . There are two forms of OC: uncarboxylated OC (γ-carboxylated OC, GlaOC) and undercarboxylated OC (GluOC). During bone resorption, the acidic environment in the bone resorption pits generated by osteoclasts promotes the decarboxylation of GlaOC embedded in bone matrix to GluOC, which has a lower affinity for hydroxyapatite and therefore is more easily released from bone tissue into the circulation [48, 49]. GluOC can promote β-cell proliferation, stimulate insulin synthesis and secretion, and increase the insulin sensitivity of adipose tissue, muscle, and liver, leading to increased energy expenditure . Changing osteoblast or osteoclast activity alters glucose metabolism by affecting GluOC levels. A clinical study shows that patients treated with preotact (PTH1-84), a bone formation-promoting drug for osteoporosis by increasing osteoblastic activity, resulted in an increased serum GluOC level and decreased blood glucose level . Animal experiments show similar results. Conditional deletion of the insulin receptor (IR) in osteoblasts led to impaired osteoblast differentiation and decreased OC production, and increased expression of osteoprotegerin (OPG) in IR-deficient osteoblasts hampers osteoclast differentiation and bone resorption, resulting in a reduced serum GluOC level. The decreased serum GluOC level leads to impaired glucose tolerance, insulin secretion and sensitivity [48, 52]. It is well known that long-term glucocorticoid treatment induces insulin resistance and glucose intolerance. Interestingly, it is reported that these glucocorticoid side effects are partially mediated through osteoblasts. As a glucocorticoid target gene, the total serum OC levels can be suppressed within 3 days after glucocorticoid treatments [53, 54]. The deletion of glucocorticoid signaling in osteoblasts attenuated the glucocorticoid suppressed OC synthesis and prevented the development of insulin resistance and glucose intolerance . The deletion of OPG in mice led to an increased osteoclast number and an improved serum GluOC level, resulting in higher glucose tolerance compare to wild-type animals, suggesting that osteoclasts control glucose metabolism through the regulation of OC decarboxylation. In addition to OC, recent studies also implicate an OC-independent influence of bone on energy metabolism. For example, ablation of osteoblasts in adult mice or conditional deletion of β-catenin or Lrp5 (a coreceptor of Wnt-β-catenin signaling) in osteoblasts/osteocytes leads to systemic metabolic alterations, which could not be fully reversed by OC treatment or explained by increased or unchanged serum OC level [55-57]. These results suggest that there are some other unknown factors or mechanisms involved in mediating energy metabolism by bone. Lipocalin 2 (LCN2), a newly identified hormone secreted by osteoblasts, also regulates energy metabolism (Figure 2C). LCN2 maintains glucose homeostasis by inducing insulin secretion and improving glucose tolerance and insulin sensitivity, as well as inhibiting food intake . Sclerostin is a secreted glycoprotein specifically generated by osteocytes to inhibit Wnt signaling  and plays an endocrine function to influence body composition by regulating adipocyte metabolism [60, 61] (Figure 2C). The deletion of SOST in mice or sclerostin-neutralizing antibody treatment led to reduced mass of white adipose tissue and corresponding enhancements in insulin sensitivity and fatty acid , indicating a positive role of sclerostin on anabolic metabolism in adipocytes. However, another study showed the opposite results. Enhanced sclerostin levels in mice with deficiency of Gsα in mature osteoblasts and/or osteocytes also lead to the loss of white adipose tissue . These inconsistent results might be due to the different mouse models. A recently study shows that the deletion of von Hippel-Lindau (Vhl), a hypoxia signaling pathway component, in osteolineage cells led to hypoglycemia and increased glucose tolerance in mice, which is caused by increased glucose uptake and glycolysis of osteoblasts, but not caused by OC because the serum OC level was decreased in these mice . This result suggests that osteoblasts regulate whole-body glucose homeostasis by regulating their own cellular glucose metabolism. Embryonic brain development and adult brain function are regulated by bone via GluOC  (Figure 2D). Mouse maternal GluOC can cross the placenta and blood-brain barrier to directly promote brain development and the acquisition of cognitive function in the fetus . In adult mice, GluOC can also pass through the blood-brain barrier to promote brain-derived neurotrophic factor expression and affect cognitive function of the brain. OC absence in mice resulted in deficiency of spatial learning and memory and a worsened anxiety-like behavior. Delivering GluOC can correct age-related cognitive decline and decrease anxiety-like behavior and functions [63,64]. In addition, GluOC can regulate male fertility by promoting testosterone production and inhibit the apoptosis of Leydig cells in testes  (Figure 2E). Bone also has important effects on muscle. GluOC increases IL-6 production of muscle, which enhances glucose and fatty acid uptake of myofibers, and then promotes adaptation to exercise . In addition, a comparatively high concentration of GluOC administered exogenously increased muscle mass in aged mice . Moreover, in vitro studies have shown that bone marrow mesenchymal stromal cells stimulate myoblast proliferation through the paracrine release vascular endothelial growth factor (VEGF) , and osteocytes can support myogenesis and muscle function by secreted prostaglandin E2 (PGE2) . These results indicate the positive influences of bone on muscle (Figure 2F). Based on these data described above, in addition to the classic functions of movement and protection, the skeleton has extraskeletal functions that play important roles in the maintenance of vital organs/systems and the general health (Figure 2). We, therefore, define these classic and extraskeletal functions of skeleton as BONE FUNCTION (Figure 3A). The impaired bone function may lead to bone dysfunction. The body is composed of multiple organs/systems and exists and functions as a whole system. There is elegant coordination and crosstalk among different organs/systems, which makes our bodies functional in physiological situations and might also accelerate the dysfunction or failure of multiple organs/systems during severe diseases. For example, chronic renal failure can lead to heart failure. As for the skeleton, in some pathophysiological situations including diseases affecting bone tissue (such as genetic bone diseases or osteoporosis) and/or other organs/systems (such as systemic inflammation, chronic kidney disease (CKD), diabetes, etc. ), the impaired functions of bone cells might lead to abnormal bone formation or resorption, and then result in bone disorders characterized by impaired bone microstructure and decreased bone strength, which increases bone fragility and fracture. Furthermore, the abnormalities of the skeleton might also injure the homeostasis of other organs/systems by changing the production and metabolism of BDFs, which might subsequently lead to dysregulated or impaired function of extraskeletal organs/systems (Figure 3B). For example, osteoporosis is the most common bone disease in humans characterized by bone loss, microarchitectural deterioration, and compromised bone strength [70,71]. Osteoporosis leads to increasing bone fragility and propensity for fracture, particularly in postmenopausal women [70-72]. Recent studies also show that there is close relationship between osteoporosis (Or low bone mass) and other system diseases or mortality. Osteoporosis is associated with an increased risk of the incidence of Alzheimer's disease dementia . Low bone mass is also associated with increased all-cause mortality of the elderly, and is also an independent risk factor for mortalities of stroke, chronic lung and cardiovascular diseases [74-77]. Osteoporosis treatment can reduce mortality in elderly and frailer individuals with osteoporosis who are at high risk of fracture . Osteopetrosis is a kind of bone genetic diseases sharing the hallmark of a generalized increase in bone mass . Many patients with osteopetrosis have more brittle bones and increased incidence of anemia and recurrent infections . Activating mutation of β-catenin in osteoblasts led to osteosclerosis and the development of acute myeloid leukemia (AML) in mice, and thirty-eight percent of patients with myelodysplastic syndrome (MDS)/AML showed increased β-catenin signaling in osteoblasts . Therefore, as mentioned above, we define these disorders of bone itself, and the impaired extraskeletal functions of bone as BONE DYSFUNCTION (Figure 3B). Critical illness describes a health status with dysfunction or severe damages of one or multiple important organs/systems and includes conditions such as sepsis, shock, acute respiratory distress syndrome (ARDS), acute renal failure, heart failure, disorders of the immune and hematopoietic systems, endocrine and metabolic disturbances, and electrolyte and acid-base imbalance [81-84], etc. However, as one of the largest organs with an emerging important role in regulating multiple organs/systems, changes of the skeleton and its functional role during critical illness remain poorly understood. We previously proposed a relationship between bone and critical illness and the potential important role of bone dysfunction in critical illness , which has been supported by increasing evidences. 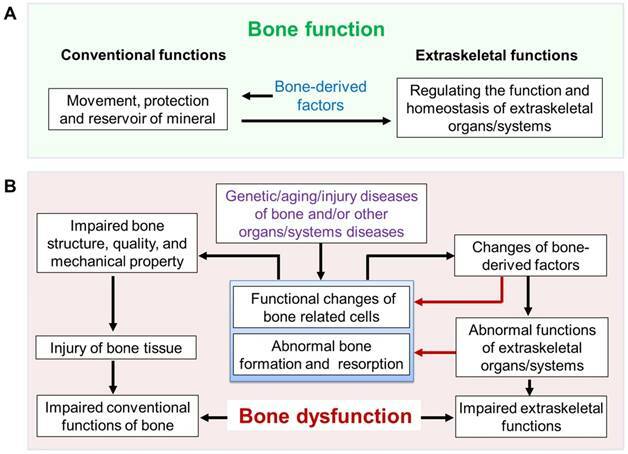 Bone function and hypothesis of bone dysfunction. (A) Bone function includes conventional functions (such as movement, protection and reserve of minerals) and extraskeletal functions (regulation of the function and homeostasis of extraskeletal organs/systems such as hematopoietic and immune systems, mineral and metabolism, etc.). (B) Hypothesis of bone dysfunction. In some pathophysiological situations, including genetic/aging/injury diseases of bone and/or other organs/systems diseases, the disorders of bone itself and the subsequently impaired function of extraskeletal organs/systems caused by abnormal bone (impaired extraskeletal function of bone) are defined as BONE DYSFUNCTION. The most significant pathological changes in bone during critical illness are accelerated bone loss and increased risk of fracture, especially in patients with osteoporosis [86-88] and especially following a prolonged stay in an intensive care unit (ICU) [89, 90]. These changes in bone are ultimately due to enhanced bone resorption and impaired bone formation. Bone resorption activity is significantly increased in critically ill patients. C-telopeptide of type I collagen (CTX) and N-telopeptide of type I collagen (NTX) are degradation products of type I collagen during bone resorption. Serum levels of CTX or urine NTX are recommended as biochemical markers of bone resorption and have been used in clinical diagnosis . Patients with critical illness had obvious enhanced bone resorption activity with elevated serum CTX and urine NTX levels [90-94]. In addition, bone formation is also profoundly affected by critical illness. N-terminal propeptide of type I procollagen (P1NP) is cleaved from procollagen molecules in the extracellular matrix before the assembly of type I collagen molecules into fibers . P1NP, OC and serum bone alkaline phosphatase (bALP) secreted by mature osteoblasts are used as biochemical markers to assess osteoblast function and bone formation . Patients with critical illness had a significant increase in P1NP and a decrease in OC levels, which suggests an increase in the activity of immature osteoblasts, with low activity of mature osteoblasts . We also found that serum bALP levels were lower in infected newborns than that in the non-infected group . These changes in osteoblasts might be a possible cause for bone loss and demineralization of bone in critically ill patients . Our animal study also showed decreased bone mass and mRNA expression of OC in mice with systemic inflammation and sepsis caused by lipopolysaccharide (LPS) treatment . Other animal experiments showed that the increased apoptosis or acute deficiency of osteoblasts might be another reason causing impaired of bone formation [23, 98]. In addition to the enhanced bone resorption and impaired bone formation, some molecules secreted from bone cells are also influenced by critical illness. For example, LPS stimulates osteoblasts to generate IL-1, IL-6, and tumor necrosis factor α (TNF-α), which are important cytokines regulating inflammation. Furthermore, researchers also found that pro-inflammatory factors promoted osteocyte secretion of FGF23 , and plasma FGF23 levels were elevated in critically ill patients . The causes of these changes in bone have not been fully elucidated but are intimately connected with extremely stressful situations such as vitamin D deficiency, glucocorticoid therapies [94, 101], long-term bed-rest, inflammatory environments, and disorders of metabolism such as glucose and hormones in critical illness [88, 94, 102, 103] (Figure 4). The important role of bone in the maintenance of vital organs and systems described above strongly suggests that bone might be a critical player in the initiation, progress and prognosis of critical illness. Patients in the ICU who died showed a greater degree of bone loss . Low osteoblast activity (characterized by decreased bALP serum levels) was inversely correlated with the scores for neonatal acute physiology-perinatal extension II (SNAPPE-II, an index assessing neonatal illness severity in the neonatal ICU population) of infected neonates . Higher serum FGF23 levels are also independently associated with greater mortality in critically ill patients with or without CKD [100, 105]. Animal experiments showed that osteoblast ablation in sepsis led to a high mortality rate in mice . These studies provide important clinical and animal experimental evidences supporting the causal links between disorders of bone and the severity and outcome of critical illness. The mechanisms underlying the important role of bone in the pathogenesis of critical illness have not been fully clarified to date. Changes of some BDFs might participate in the pathogenesis of critical illness. Decreased serum levels of OC might contribute to abnormalities of glucose metabolism, such as hyperglycemia in critical illness. Elevated serum level of FGF23 might contribute to hypophosphatemia during sepsis . Meanwhile, the increased FGF23 level might be related to the impaired defense and inflammatory status of critically ill patients as FGF23 has been found to impair neutrophil activation and stimulate hepatic production of inflammatory cytokines [106, 107]. Furthermore, pro-inflammatory factors secreted by bone cells such as high mobility group box 1 protein (HMGB1), RANKL, TNF-α, and IL-1/6 might also aggravate the systemic inflammatory response in critical illness [108-110]. Osteoblast-derived IL-7 regulates early lymphopoiesis, and decreased IL-7 expression in osteoblasts resulted in lymphopenia in sepsis mice . However, the detailed roles and underlying mechanisms of bone in critical illness need further studies. Briefly, the above mentioned data suggest that damage or changes in bone function are highly related to the severity and prognosis of critical illness. 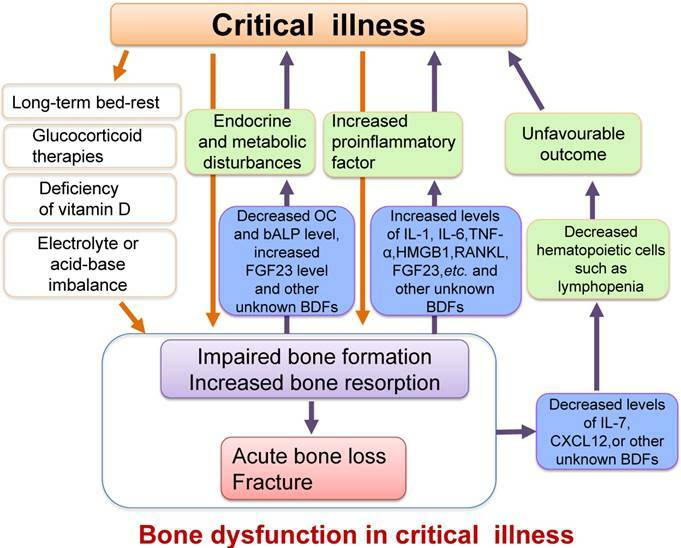 Therefore, we hypothesize that there is bone dysfunction in critical illness, which is likely to be involved in the pathogenesis of critical illness and that improvement of bone function might benefit the critical illness prognosis (Figure 4). Schematic diagram illustrating the relationship between critical illness and bone dysfunction. Many pathological conditions such as inflammation, endocrine and metabolic disturbances, electrolyte and acid-base imbalance or vitamin D deficiency, as well as other causes such as long-term bed-rest or glucocorticoid therapies in critical illness could result in impaired osteoblast function and increased osteoclast activity, ultimately leading to acute bone loss and even bone fracture. Furthermore, the impaired osteoblast function and enhanced bone resorption could also cause increased secretion of proinflammatory factors, which might exacerbate the systemic inflammatory response. The changes of some BDFs secreted by osteoblasts such as the decreased serum levels of OC, IL-7 and CXCL12 or increased FGF23 level in critical illness may also worsen metabolic or hematopoietic disorders. We define these damages or changes in the structure and functions of bone as bone dysfunction in critical illness. Enhancing osteoblast function is a potential mean to improve the prognosis of patients with critical illness. Pharmacological activation of osteoblasts using teriparatide (PTH1-34), a drug for osteoporosis that promotes bone formation, improves bone mass and sepsis-induced lymphopenia, and increases the survival rate of mice by increasing IL-7 generation . We found that deletion of fibroblast growth factor receptor 1 (FGFR1) in mature osteoblasts leads to increased osteoblast activity and enhances the mobilization of endothelial progenitor cells (EPCs) into the peripheral blood by promoting CXCL12 secretion from osteoblasts, resulting in increased survival rate of mice with sepsis . The inhibition of bone resorption might be another way to regulate critical illness prognosis. A recent study shows that preadmission treatment with bisphosphonates is associated with improved survival among critically ill patients, possibly by inhibiting bone resorption and increasing bone mass . These studies suggest that improvement of bone mass or bone function is a potential novel strategy to improve the prognosis of critically ill patients, although the mechanisms and detailed approaches need to be further studied. As the one of the largest organs, the skeleton shows diverse important functions (bone function). Abnormalities of the skeleton will not only affect bone itself but will also profoundly influence other organs/systems. Dysfunction of bone might significantly affect the maintenance of our health. Improvement of bone function might benefit the function of vital organs and systems. At present, the major clinical and experimental parameters used to evaluate bone status include imaging (X-ray, CT, MRI), ultrasound, mechanical properties, histology of bone and bone metabolic markers, which mainly focus on bone structure and bone turnover (bone forming and resorbing function). Few physiological parameters of bone such as intramedullary pressure, capillary permeability oxygen and water content, blood flow, PH value, etc. are evaluated in research and especially in clinics, and the effects of these physiological parameters on bone function are not clear. In addition, BDFs, the major mediators regulating bone function, are not well evaluated. Although some BDFs are known, more specific BDFs need to be further discovered using advanced techniques such as genomics, proteomics and metabonomics. Furthermore, more animal and clinical studies also should be conducted to reveal the production and metabolism of BDFs in disease states and to clarify the roles and underlying mechanisms of individual BDF in specific acute or chronic diseases. To date, the parameters used to evaluate bone status during critical illness are mainly focused on bone mass and metabolic markers. The changes in some known and unknown BDFs, physiological parameters mentioned above, and the function of bone-related cells should be further explored during critical illness. Previous studies indicate that bone dysfunction is closely related to the prognosis of critical illness, but more evidence is needed to further examine this relationship mechanistically. Many questions remain to be answered. For example, preadmission treatment with bisphosphonates is associated with improved survival of critically ill patients; however, it is unclear if this association is related to the blunted bone resorption due to the action of bisphosphonate itself, or to the increased bone mass, or to the molecular and cellular changes caused by bisphosphonates in other cell types. This mechanism needs to be clarified. It also remains unknown if a significantly increased serum CTX is a surrogate for the outcome of critical illness. In addition, the mechanism by which FGF23 affects the mortality of critically ill patients is not known. Although only a few studies have shown that improvement of bone function might benefit the outcome of critical illness, considering the availability and efficacy of commonly used anti-osteoporosis drugs in the clinic, modulating bone structure and function might provide a novel strategy to improve the outcome of critical illness. In addition to the current drugs, further approaches with the potential to improve bone function, such as novel anti-resorptive drugs and rehabilitation measures (such as mechanical loading) should be studied for their potential beneficial effects on diseases including critical illness. ADHR: autosomal-dominant hypophosphatemic rickets; AML: acute myeloid leukemia; ARDS: acute respiratory distress syndrome; BDFs: bone-derived factors; bALP: bone alkaline phosphatase; CKD: chronic kidney disease; CXCL12: C-X-C motif chemokine ligand 12; CTX: C-telopeptide of type I collagen; EPCs: endothelial progenitor cells; FGF23: fibroblast growth factor 23; FGFR1: fibroblast growth factor receptor 1; G-CSF: granulocyte-colony stimulating factor; GlaOC: γ-carboxylated osteocalcin; GluOC: undercarboxylated osteocalcin; HMGB1: high mobility group box 1 protein; HPCs: hematopoietic progenitor cells; HSCs: haematopoietic stem cells; ICU: intensive care unit; IL: interleukin; IR: insulin receptor; LCN2: lipocalin 2; LPS: lipopolysaccharide; LT-HSCs: long-term HSCs; MMP-9: matrix metalloproteinase 9; MDS: myelodysplastic syndrome; NaPi-2a: type IIa sodium-phosphate co-transporter; NCC: sodium-chloride co-transporter; NTX: N-telopeptide of type 1 collagen; OC: osteocalcin; OPG: osteoprotegerin; P1NP: N-terminal propeptide of type I procollagen; PGE2: prostaglandin E2; PTH: parathyroid hormone; RANKL: receptor activator for nuclear factor-κ b ligand; SCF: stem cell factor; SNAPPE-II: neonatal acute physiology-perinatal extension II; TIO: tumor-induced osteomalacia; TNF-α: tumor necrosis factor α; TRPV5: transient receptor potential vanilloid-5; Vhl: von Hippel-Lindau; VEGF: vascular endothelial growth factor. We thank Meng Xu for modifying the figures. National Natural Science Foundation of China (No.81830075, 81870621), Independent Research Project of the State Key Laboratory of Trauma, Burns and Combined Injury, Third Military Medical University (No. SKLZZ(III)201601), Innovative Research Team in University (IRT1216).